Planning for a project is the cornerstone of management. If you want to learn how the pros do it, watch Jennifer Bridges, PMP, and up your game. You can learn a lot from books, but it’s the real world that hones project management skills, as Jennifer said in the video. She makes the analogy that your project plan is the playbook for your team to execute, monitor and control the project. Of course you have to start your project off on the right foot, as we wrote about, but it doesn’t hurt to know how to better do this by listening to those who have taken that journey many times over. Here are the 10 tips they suggest to better your project planning. If you follow this advice your project is more likely to run on schedule, within budget and achieve the goals of its stakeholders. Then, in time, you’ll become a seasoned vet who will be passing on your sage knowledge to newcomers. Pro-Tip: Once your project plan is in place remember to set a good tone for the team, keeping the atmosphere healthy: providing nutritious food, downtime and exercise to keep performance levels and morale high. 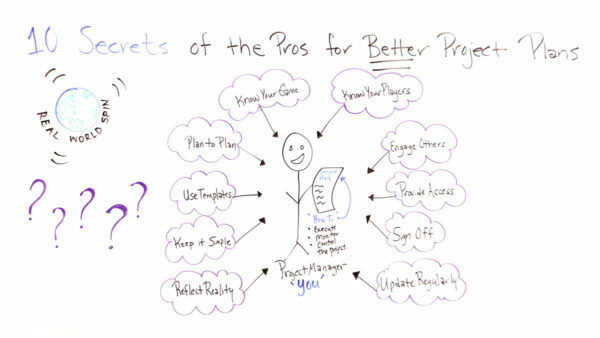 Today, we’re talking about 10 secrets of the pros for better project plans. We’re going to talk about a real-world spin on the project plan. When I think of project plans, I can’t help but think about sports. I think of the project plan as the playbook that the team is going to use to execute, and monitor, and control this project. So when you’re building these better plans, some things to remember is, you as the Project Manager have to know your game. That project plan, your playbook, is your game, so you have to know everything in it. You have to know more than anybody about this project, and that’s what the plan does for you. You also have to know your players, who’s going to be executing this plan, what are their strengths, where do they need support, and who needs to communicate with who to know what’s going on. When you’re making your plans, you need to plan to plan. You need to set aside time and think through, what do I have in this plan, what do I need, and where do I get it? You also use templates. Don’t start from scratch. Use a template maybe you used before or someone else has used before. That’ll save you a lot of time and help you think through things for the project so you don’t forget. Also, keep it simple. Remember, this is a playbook. These are plays that people are going to take and execute along the way, so the more simple that you can be the better. Also, reflect reality on your project. Make sure the plan reflects reality, and it’s relative to your project and the people who are going to be doing the work. There some other secrets, as well. You want to be sure to engage others. Engage those people who are going to be executing the plan. Engage those who are going to be impacted. Get their input so they’ll help you know what is going to work and where, maybe, you could run into some challenges along the way. Also, provide access to these team members, as well. For the team members who are going to be executing these plays or executing activities, let them have insights into not only their work but others’ work, and build dashboards that are customized so they can see things clearly. Also, get the appropriate people, the stakeholders, to sign off. When you get them to sign off, you’re getting their buy-in and their commitment to help support the project along the way. Also, update your plan on a regular basis. You have to know going in that the fact is that this plan is going to change all along the way, so it’s very important to keep it updated regularly and consistently. So if you need a tool that can help you with a better project plan, then sign up for our software now at ProjectManager.com.